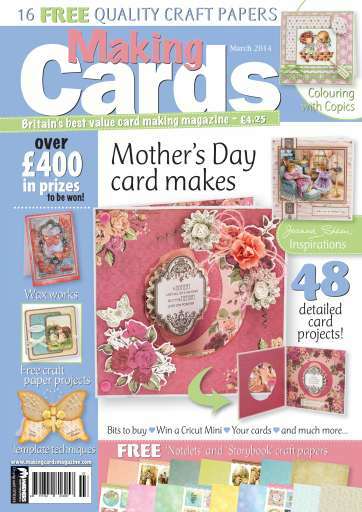 This month I am delighted to present you with your free craft papers, Notelets and Storybook. Notelets is a very versatile set featuring square notelet toppers picturing various images and sentiments, all in a beautiful colourway set of baby pinks, blues, bright sunshine yellow and charming greens. Whatever the occasion this set is one you’ll be able to turn to and find the perfect element for your card. Your second set, Storybook is a charming collection of beautiful vintage illustrations picturing children enjoying the simple joys of childhood of years gone by and in aged green and beige tones like the pages of an old storybook. The accompanying backing papers have been given a vintage feel and when matched up carefully will in fact cross over and work with both craft paper sets. 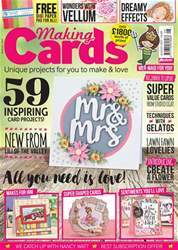 For those of you who will be creating Mother’s Day cards both Notelets and Storybook provide imagery which can be used to create a card a mother will treasure. In Joanna Sheen’s Inspirations Joanna shares memories of times with her mother and shares her final design for her Mother’s Day card this year with us. We are also honoured to share her most special photo of her mother and herself. Turn to page 12 to find out more. We’re jam packed full of exciting projects for you to follow from our regular contributors. Dee Paramour shows how to create two different shaped cards using only one template while Tracy Evans explores teaming melted bees wax granules with metallic guiding wax to create a stunning shimmery effect. Emma Williams shares a great template that has been used to create a stunning card picturing couture ladies.